Get Through Intercollegiate MRCS Parts 1 and 2: MCQs and EMQs has been written by experienced surgeons and features four practice papers: two covering each part of the examination. All questions have been modelled on actual exam questions so that they accurately reflect the style and level of difficulty. Detailed explanations are given in the answers to help candidates use the book as a revision aid as well as a self-test book. All surgical trainees preparing to sit the two parts of the MRCS examination will find this book an invaluable aid to their revision, as well as keen medical students with an interest in surgery as a future career. Useful book to get an idea about the new Intercollegiate MRCS Part one and two, while most of the other books are still based on the old format. 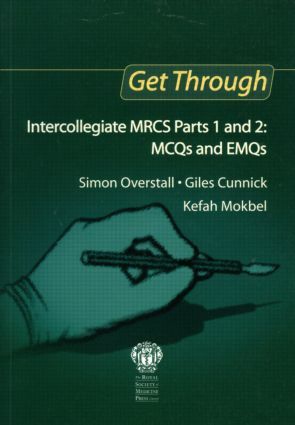 Brilliant book with MCQ and EMQ style questions as required for Parts I & II of the MRCS exam. Small, concise and informative. Easier to read than some of the bulkier Helped me pass first time! Excellent book for both MRCS part I and II. I rely on this book and managed to pass my MRCS from the first attempt. Brilliant book. Does exactly what it says on the tin … extensive MRCS-style questions covering the breadth of material encountered in the exam. If you're looking to get through as many practice questions as possible beforehand, this book will help you on your way.